What Do You Mean, Raw Drink? – Eat Me. Drink Me. What Do You Mean, Raw Drink? The first time I opened a bottle of Kombucha, I wondered who was dyeing Easter eggs. Then I took a sip of Kombucha and wondered why I was drinking vinegar. 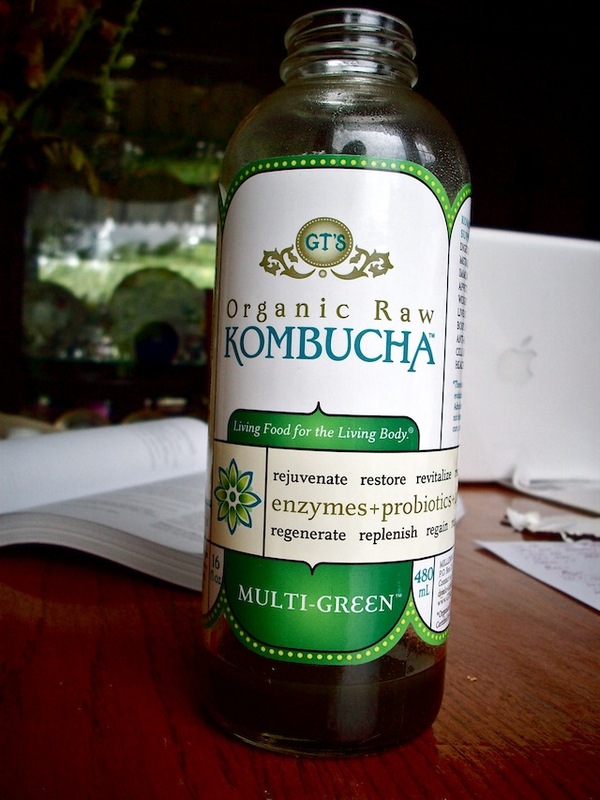 But, because I had paid around $4 for that bottle, I kept drinking, and by my last sip of Kombucha, I kind of liked it. Kombucha is a super drink first made in Qin Dynasty China, where it was called the “Immortal Health Elixir”and thought to balance middle Qi (spleen and stomach). According to the label on my bottle of Kombucha, it aids digestion, metabolism, immune system and liver function, appetite and weight control, body alkalinity, anti-aging, cell integrity, and healthy skin and hair. Of course, none of that has been evaluated by the Food and Drug Administration. Part of the reason I keep coming back to Kombucha must be for its health benefits, because no matter how many times I buy one, the first sip is always a shocker. When it first hits your tongue, it’s sweet and intensely fizzy, but almost instantly becomes sour as it slides past the sides of your mouth. I recently learned that you can grow your own Kombucha – and I do mean “grow,” because Kombucha is tea fermented by a bacteria colony. Alive like yogurt. To grow your own Kombucha, you brew a weak-ish batch of black tea sweetened with sugar, cool it to room temperature, and then float the Kombucha colony in it. The Kombucha colony, by the way, is called a mushroom and looks like a disk of blubber. In about ten days, you have your Kombucha brew, which you can strain and refrigerate. Your Kombucha colony can be dropped in a new batch of tea and might even start growing baby Kombuchas, which you can give to your friends so they can start their own Kombucha colonies. Kombucha imperialism. I may not be at the point in my relationship with Kombucha that I’m about to grow it in my basement, but I’ll endorse it, because if nothing else it’s interesting. And it’s probably good for you. If you’re interested in how to make your own Kombucha, check out this rather entertaining YouTube video. We were just talking about this drink in Ithaca recently! Know some people that really like it but said the same thing about the vinegar at first!